Chattanooga FC Academy players will once again receive free admission to home games during the 2019 season. That donation to our club by CFC has the potential to be worth up $70,000 or more. For parents and other fans, CFC has also announced a simplified season ticketing plan for the upcoming season which includes most guaranteed games in club history. This year, fans who purchase as season pass can save about 40% off the regular price of attending all games. Ticketing packages are on sale now with new merchandise also available in time for the holidays. SILVER LEVEL ($155): The Silver Level home jersey pass gives you at least 40% off individual game day tickets (based on a minimum of 16 home matches in 2019). You receive entry to every CFC men’s home match including pre-season exhibitions, NPSL regular season, NPSL playoffs, and NPSL Founders Cup matches. The season pass also includes early entry to Finley Stadium and free online streaming if you happen to be out of town. CLUB LEVEL ($95): The Club Level package includes everything in the Silver Level package except the home jersey. *All orders placed before December 17 will include a Season Pass Stocking Stuffer Certificate for each season pass purchased. 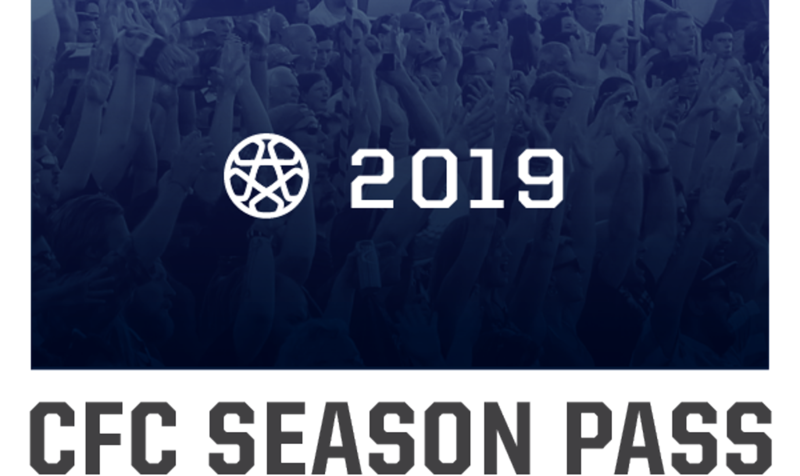 *Wristbands will available for pick up at the annual Jersey Reveal Party (spring 2019) or at Season Pass Will Call before any match during the season.